This superlative pear-shaped polychrome ceramic vessel has two protruding crocodile heads with a beautiful complex painted motif that stands on hollow rattle tripod legs. Openwork mouth prominently exposes his upper and lower teeth. 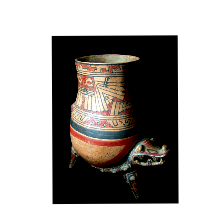 A ritual imagery of Tlaloc is decorated between the upper and lower geometric designs. Buff Tan slip, burnished, with black and orange-red paint. The powerful crocodile prevailed in design schemes at an earlier period. 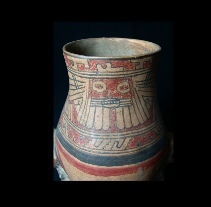 The added human or deity face on this vessel makes it very unique as both symbols are associated simultaneously with the rains, fertility and life giver. 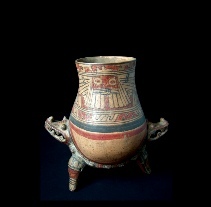 Sequence of major Archaeological cultural phases in pre-hispanic Caribbean Islands are: Saladoid and Taino. Links are no longer Available.